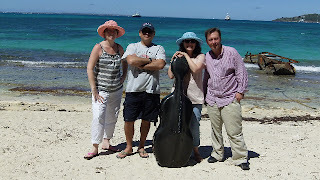 ODEONQUARTET returned from a week in the small French/Dutch island of St. Martin/St. Maarten a few days ago. This was a trip made possible by the collaboration of many folks in different locations, all devoted to the idea of bringing chamber music to the island. You would think that a lighter program, perhaps some Philip Glass, Ljova, maybe some shorter works, would have been just the ticket, but we got the message that they wanted a real meat and potatoes program. So it was that we played a movement from the American composer George Rochberg’s Sixth String Quartet, the entire first Bartok quartet, and the incomparably beautiful Beethoven Op. 59, No. 1 quartet, which is the first of his “heroic” period quartets and clocks in at about 45 minutes. Having flown in from Seattle, where we’d been hailed upon of late, and were in...oh...about our sixth month of yearly gray gloom, and emerging into the intense Caribbean sunlight was actually a little bewildering for me, at first. The sun tracks directly overhead and it is surprisingly humid. It wasn’t until a bit later that I discovered the delicious wonderment that is a warm Caribbean breeze. It just really never gets cold enough, even in the shade, even at night, to feel chilly. Sitting under an umbrella or on a shaded porch overlooking the ocean is simply a delight that I won’t soon forget. The soft breezes carry a silken warmth that feels like a guilty pleasure to this Pacific Northwesterner. All this new-found hedonism did not necessarily put me in the frame of mind for the tale of angst-y unrequited love that is Bartok’s First Quartet. Furthermore, the last movement is Bartok’s first instance of trotting out formalized folk material, and he uses this first foray into the technique to spin out pages and pages of ever more intense and relentless Carpathian Basin musical madness. One friend refers to the piece as a “tapeworm”. So this was the odd thing: our mission was to perform and bring this music to a new audience, but here we were, on the beach, experiencing the unveiling of bare skin for the first time in 2011. What’s a violist to do? The answer, of course, is the same as always: focus, and be professional. It meant a bit less relaxing and unwinding in vacation mode, more time in the air-conditioned hotel room doing some warming up and practice, and less time doing tourist activities. Honestly, I think it was a very nice balance, as we had two entirely free days. We went on a hike one day, and drove around the island on another, stopping in at the various towns and beaches, getting French pastries and trying to stay out of the sun. It is probably true that I’m more constitutionally suited to being inside, practicing, performing, writing, teaching...but it was a delight to visit. The most gratifying moment for me, personally, was meeting the middle-aged black man, toothless and wearing his abundant hair tucked up into a knit cap, whose friends had chipped in to buy him a ticket to our concert. It was the first time he’d heard a string quartet, the first time he’d heard Bartok, the first time he’d heard of or seen a viola. He was absolutely enthralled and his excitement about the performance and the music was deeply moving. Talking to him after the concert was truly an honor. Additionally, two girls who played the violin wanted to get some advice on how to hold and use the bow properly. I took a deep breath and tried to tell them everything I could in a few minutes about general bow technique principles. They seemed incredibly enthused and I was grateful for the opportunity to be helpful. Last night I went to see the opera. 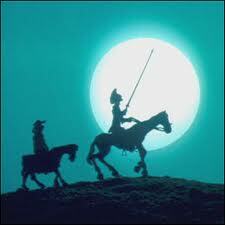 It was Massenet’s Don Quichotte, presented by Seattle Opera. I confess to have been a little irked at the opening: why so much funding lavished on the opera, when other arts organizations go without? why do I have to sit through yet another big stage production of a party scene? why is this music so worn out and banal...? Last week I had the distinct privilege of hearing Agata Zubel, Polish singer and composer, perform with the Seattle Chamber Players. Recently, I had a conversation with a friend about all the women who went up in smoke courtesy of the Christian church's assertion that they were witches who needed saving...this is, of course, hundreds of years ago, and those of us who are products of the European Judeo-Christian tradition can rest assured that we've gotten over that sort of thing, as regards women. Except that those efforts so long ago did serve to wipe out the matrilinear conveyance of the so-called womanly arts: healing traditions, a mystical connection to nature, midwifery, knowledge of medicinal herbs...and countless rituals I'm sure I know nothing about. The upshot is that the learning and passing on were arrested in their tracks, and replaced with a fear, among women, of practicing these arts: a fear of being authentically womanly. This is what I was discussing with my friend, and I must admit that it's a new way of looking at women's history, for me. I've been turning it over in my mind all week. It's a plausible explanation for our male-dominated culture - I don't mean to say that women don't have all kinds of fantastic opportunities in 21st century American society - we do! And I'm incredibly grateful to be alive here and now rather than, say, Iran. So, when I went to hear the spectacular Agata Zubel sing last week, all these thoughts had been percolating in my mind for a while. Witnessing her performance was a stunning experience. She draws on a deep spirituality and complete commitment to the moment as she performs. It feels like each sound she creates resonates in every molecule of her existence. Her first work was a Berio Sequenza...she strode onto the stage already muttering under her breath, stood before her music stand still chattering to herself for a few moments before suddenly gawping at the audience, as though she suddenly realized we were staring at her, too. The sounds in the Sequenza ranged from Bushman-like clicks to mad laughter, chattering like I'd imagine a schizophrenic cacophony of internal voices would sound, to the occasional loving and gorgeous melodic line. Her command and control of all these cascading and colliding effects was virtuosic in the extreme. Her own compositions are filled with space and silence, little sounds at the extremes of her vocal registers, microtones, great swooping gestures, and the occasional intelligible phrase.. a sonic depiction of a deeply personal inner landscape. Or an examination of a psychology played out in real time. The effect was mesmerizing and disturbing. And it was extremely compelling. I felt I was witness to this amazing musician's private, highly organized yet vulnerable inner world. There was a piece on the program which was about a dream that Hildegard of Bingen experienced - that Europe was to be engulfed by a Muslim invasion. It was during this song, full of searing microtonal tension, that I had the thought that Agata Zubel would not have been appreciated during the time of the various witch trials, whether in Salem or Spain or elsewhere in Europe. She is a woman deeply connected to a spiritual or otherworldly place, serving to allow her listeners to journey to potentially uncomfortable inner spaces. I found her work utterly inspiring, and am continuing to ponder my sisters, lost so long ago, and what knowledge may have perished with them. But we are fortunate to live in a world where the work of Agata Zubel is not only possible, but celebrated and cherished.